Josef Piotroski - Associate professor of accounting at the Stanford University Graduate School of Business. Developed the F-Score.. 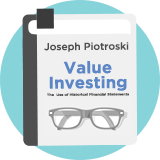 Here follow a selection of stock screening strategies that we have modelled based on the writings of or about Josef Piotroski. These strategies are not endorsed by the author.